UNCOMPROMISING INNOVATION The most respected name in kitchen ventilation. Made in the USA since 1933. 1-800-331-2492 www.ventahood.com See your KITCHEN VENTILATION DREAMS come to life at: ventahood.com At Vent-A-Hood ® , our uncompromising dedication to kitchen ventilation drives us to constantly improve and innovate. And it drove us to create the world's first interactive range hood design portal. Say "Hello!" 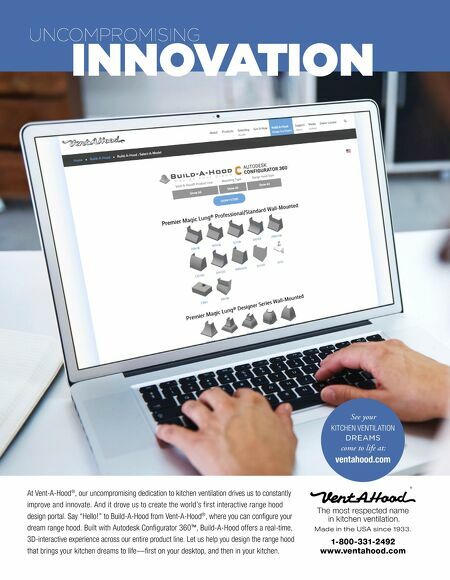 to Build-A-Hood from Vent-A-Hood ® , where you can configure your dream range hood. Built with Autodesk Configurator 360™, Build-A-Hood offers a real-time, 3D-interactive experience across our entire product line. Let us help you design the range hood that brings your kitchen dreams to life—first on your desktop, and then in your kitchen.